-Order Shopper Guides for “Delivery by Mail” ….. The JUNK JAUNT® SHOPPER GUIDE is a “must have” for finding those hidden treasures and gastric delights while conserving time and gasoline. The JUNK JAUNT® SHOPPER GUIDE is the listing of all vendors who have registered their sales. For the past several years, we have had over 550 registered vendors in 35 JUNK JAUNT® area towns, for a total of 135+ pages in the Shopper Guide. Printing is scheduled for late August with pre-orders being filled in EARLY-September, or as quickly as they are printed. THIS IS A PRE-ORDER ONLY, PRINTED GUIDE WILL SHIP IN EARLY SEPT., 2019. NOTE: Mail Orders will be accepted through Sept. 13, 2019. – NO shopper guides will be mailed after September 15, 2019. Shopper guides will also be available after September 15th, 2019 as a Digital Download (.pdf) and printed copies at certain local area businesses (TBA summer 2019), plus a few participating businesses located outside the JUNK JAUNT® area. DEADLINE FOR MAIL ORDERS – NO shopper guides will be mailed after September 15th, 2019 so get your order in early! What is a ‘Shopper Guide’? The JUNK JAUNT® Shopper Guide is a catalog of information compiled to help you get the most from your JUNK JAUNT® experience. A new Shopper Guide is published each year as at least 70% of the Registered Vendors change from year to year. In the 120-130 pages of the Shopper Guide you will find a separate section for each of the participating towns. Street maps for the town. Listing of lodging & eating establishments. The addresses of all Registered Vendors and a sampling of the items they have for sale. Each Vendor has a number and that number is on the Shopper Guides town map in the proper location. Advertising for local businesses and services. Interesting facts and Historical sites within the area. 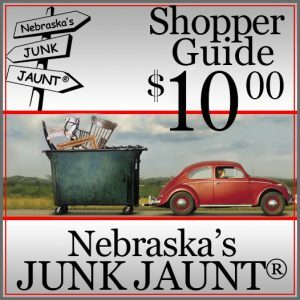 A JUNK JAUNT® Shopper Guide can be PRE-ordered at your convenience here at JunkJaunt.com, but will not be “off the Press” normally until EARLY-September. Click here to learn “How or where to purchase” your copy of the JUNK JAUNT® Shopper Guide. Printed Shopper Guides MAY be available at selected locations on the JUNK JAUNT® route, WHILE QUANTITIES LAST. CLICK HERE for locations. How can I purchase a ‘Shopper Guide’? SHOPPER GUIDES CAN BE ORDERED IN 3 Ways — 1. PRE-ORDERED ONLINE at JunkJaunt.com, 2. Mail in postal form …, and 3. in late September 2019 as a DIGITAL DOWNLOAD that can be used on your mobile device. 1.) OPRE-ORDER ONLINE OPTION — PRE-Order ONLINE FOR US MAIL DELIVERY in Mid September, 2019 $13 ($10 + $3 postage & Handling) each. THIS IS A PRE-ORDER ONLY, PRINTED GUIDE WILL SHIP IN EARLY SEPT., 2019. NOTE: Mail Orders will be accepted through Sept. 13, 2019. – NO shopper guides will be mailed after September 15, 2019. Printed Shopper Guides WILL be available at selected locations on the JUNK JAUNT® route, WHILE QUANTITIES LAST, locations will be available here at a later date. At LOCAL BUSINESSES in many of the JUNK JAUNT® communities — available for $10. At a few participating businesses located outside the JUNK JAUNT® area — available for $10. Download a printable page, complete and mail back to theNEBRASKA’S JUNK JAUNT® office. DEADLINE FOR MAIL ORDERS – NO shopper guides will be mailed after September 13th, 2019 so get your order in early! 3.) DIGITAL DOWNLOAD — Purchase AND Download the Digital Shopper Guide from this website using a Credit Card or PayPal account. Shopper guides will also be available AFTER September 15th, 2019 as a Digital Download (.pdf) for $10.75 ($10 + $.75 Handling). This will not be available until the printed guide is finalized in early September 2019 from our printer.